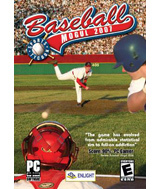 Baseball Mogul begins in any year you choose, from 1900 to 2006 with the full roster of your favorite team--or an entirely fictional team of your own creation. As general manager, your job is to build the best lineup of players to take your team to the World Series. You can make complex player trades and sign players to multi-year contracts as you build your team, but you'll have to compete with the other General Managers, and negotiate with the player's agents. Baseball Mogul is designed to help you manage your team over many simulated years. Manage your team one day at a time, or let the computer simulate weeks or months at a stretch so you can play for virtual years or decades. As your players age, their abilities mature and decline realistically. Don't forget to build your team for the long term, rather than spending all your money on free agents this season. Comments: Bring another baseball mongul game for future players and come out with the nfl for football.